Over the past years, the sector of “virtual reality” has been growing tremendously. A growing number of companies is devoting themselves to the development of software and hardware for “virtual reality” devices. In the following blog article, we’ll introduce you to the HTC Vive in particular, but also some alternative VR devices. The HTC Vive was developed in cooperation between HTC and Valve with the goal of developing a set of VR glasses for entertainment. They have a resolution of 2160 x 1200 pixels and an update rate of 90Hz. A front camera integrated in the device enables the insertion of physical objects into the virtual world. Furthermore, the Vive has several, integrated sensors as well as two base stations that enable 360° motion tracking. This is possible thanks to the “Lighthouse” technology developed by Valve. 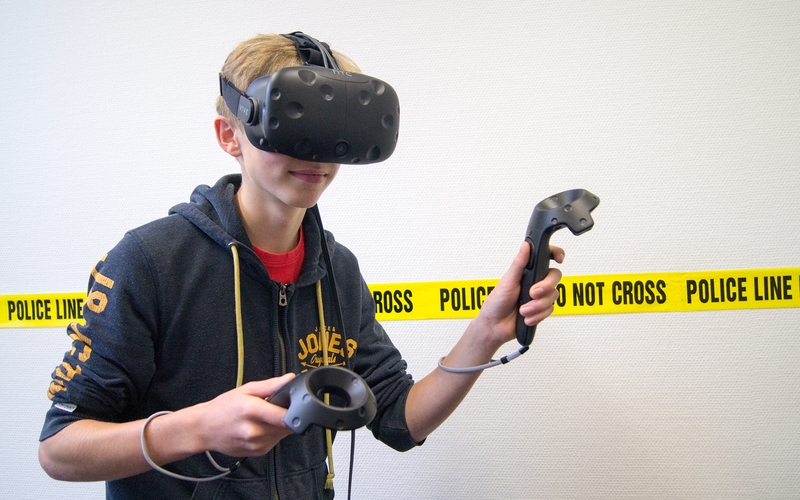 In order to interact with the objects in the virtual world, the HTC Vive comes with two hand-held controllers that are equipped with sensors for motion tracking as well. For maximal comfort, the Vive has adjustable straps for the head as well as replaceable foam material padding. It is said to be convenient for most wearer of glasses. We tested the VR glasses with a game called “The Lab” that has been developed for virtual reality. Donning the Vive, you step into another world. The controllers function as your virtual hands an operated, at least during our test, flawlessly. When looking around, nothing is juddering and you can move freely in your virtual “cage”. The 360Q view is working perfectly as well. Before being able to use the Vive, the system with both base sensors has to be installed in the room. The space for it shouldn’t be bigger than 5 x 5 meters or 197 x 197 inches. Once this hurdle is taken, one has to put up with the cables of the VR glasses that oftentimes get in the way and thus slightly diminish the gaming experience. The weight of the glasses can become a bit annoying as well. Thanks to the foam material it doesn’t pinch, however you can still feel the weight. The HTC Vive is, by far, not the only virtual reality device on the market. It’s biggest rival would be the Oculus Rift. Contrary to the Vive, however, the Oculus Rift was thought to be used while sitting or standing. It is not able to track motion in a larger space like the Vive does. The same can be said about other VR glasses like the Playstation VR. One advantage of the Playstation VR, however, is its price. While you have to pay $ 600 for the Oculus rift and about $ 800 for the HTC Vive, the Playstation VR comes at a price of “just” $400. One has to take into account that the usage of a Playstation VR also requires a Playstation and controllers. The Oculus Rift as well as the HTC Vive require a PC that can fulfill the high system requirements of the VR devices. Before getting such high priced VR glasses, it is thus advised to check if your PC or console is able to meet the technological requirements of a virtual reality device.